I’m stunned at how coherent and sensible I sound in this. The Orbit UK folks are master editors, clearly. I remember babbling a lot more. Also, got this today from another Aussie writer, Justine Larbalestier, who spotted a familiar French-flavored cover getting the “tower o’ books” treatment (among lovely company) at the Utopiales Festival. 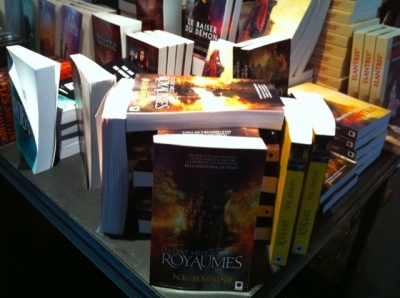 So enjoy this reminder, Francophone fans, that Les Cent Mille Royaumes is now available! BTW, courtesy of my French publisher, here’s sample chapters in PDF format to get you started. ETA: Sorry, the Orbit folks took down the old YouTube link to fix the sound. Here’s the updated one! Great to see you (sort of) in the flesh! It’s interesting to watch an Australian and an American at the same table — one of these things is not like the other one, one of these things uses the letter R to elongate vowels but otherwise ignores it. Are you coming to the Continent? It’s lovely here, you know, despite us being a bunch of socialists and stuff. When I try to watch the interview, I’m getting a message saying “This Video has been removed by the user.” Do you know if it’s going to be back up?